On a mid-June evening, 18 women bob, float, chat, sign, and smile in the warm, therapeutic waters of Tamarack Pool in south Eugene. They are accompanied by a team of volunteers, interpreters, and staffers, but they also look out for each other. For those who can’t kick, there is someone who pushes. For those who can’t hear, there is someone who signs. For those who cannot see, there is a steady arm. 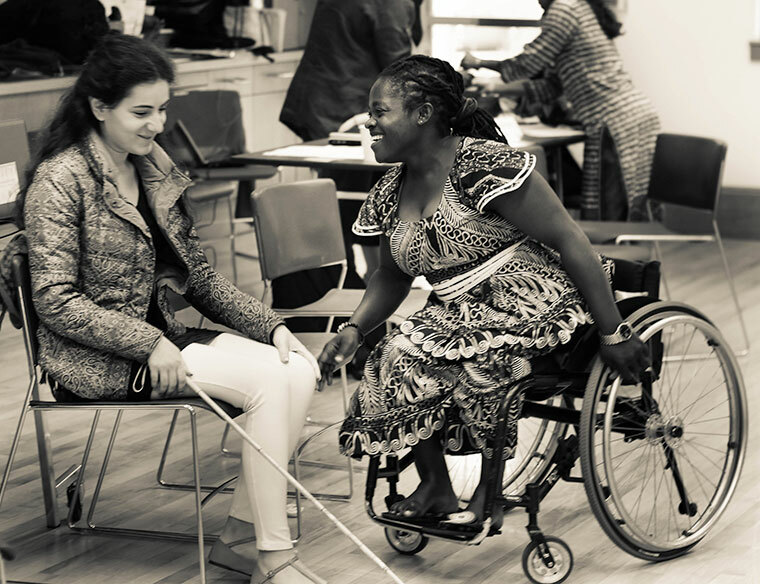 The participants are part of Mobility International USA (MIUSA)’s 2015 Women’s Institute for Leadership and Development (WILD), a program that brings disabled women from all over the world to Eugene for a crash course on disability rights, activism, and leadership. This year’s conference, MIUSA’s eighth, focuses on training select WILD alumni—they proudly use the moniker Wild Women—to teach these same skills to emerging disability leaders in their home communities. 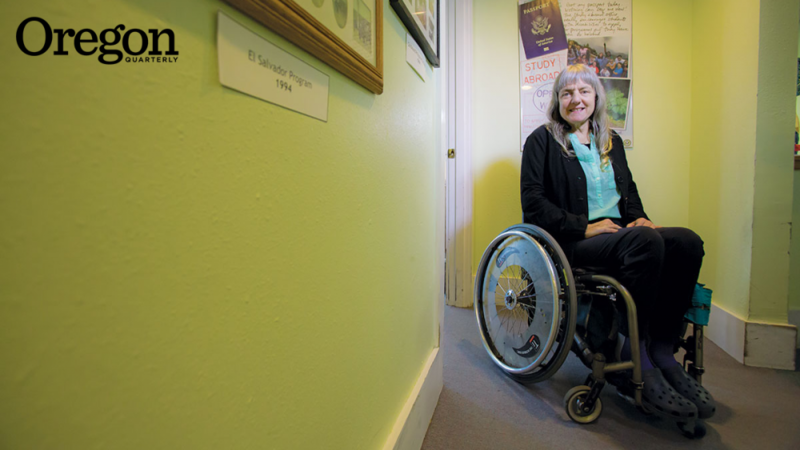 In the last three decades, Eugene-based MIUSA, led by CEO and cofounder Susan Sygall, MS ’82, has hosted dozens of international exchange programs focusing on disability rights. It has created a pioneering leadership program for disabled women, and has administered the National Clearinghouse on Disability and Cultural Exchange, a federally funded program. The organization has also brought together “dream teams” of professionals who consult internationally with government officials and changemakers who want to create laws and policies supporting accessibility and nondiscrimination. The statistics on disabled people around the world—and particularly women and girls with disabilities—are dismal. More than 500 million disabled women and girls live in developing countries. In some areas, their literacy rate is as low as 1 percent. Worldwide, only 25 percent of disabled women are in the workforce. Statistically, women with disabilities are more often victims of sexual and physical abuse. They have less access to health care and are at a higher risk of being infected with HIV. By cultivating more disabled women leaders, MIUSA hopes to change some of these harsh realities. Sygall—whose accolades include a 2000 MacArthur Fellowship, being a guest at both the Clinton (President’s Award, 1995) and Obama White Houses, and most recently being a US delegate to the UN Commission on the Status of Women—is now in her 34th year as MIUSA’s executive director. Since its inception in 1981, the spare, spunky nonprofit has been on the forefront of the global disability rights movement, empowering people with disabilities to believe in their potential and instilling in them the conviction that they have the right to the same opportunities and freedoms as their nondisabled peers. Sygall came to embrace this powerful position of advocacy through her own life experience. Early on in her journey through disability, she answered an ad for a telemarketing position. The interviewer took one look at her wheelchair and pointed to a room where “handicapped” people in wheelchairs sat in tiny cubicles hawking pencils over the phone. Sygall was desperate to work, but she didn’t take the job. A few years later, while living in Berkeley, California, she came up with the idea of creating a recreation program for people with disabilities, which in the mid-1970s was a groundbreaking concept. She confided her vision to an able-bodied male acquaintance who had experience in therapeutic recreation. He liked it. He surmised that he would be the director, and then told Sygall he couldn’t see a role for her in the program. She couldn’t drive a van. She couldn’t teach. She couldn’t physically help anyone do anything. “I’m not sure where we would put you, and how we could go about budgeting for a position you could fill,” he told her. Sygall didn’t listen to him, either. She and a friend went on to form the Berkeley Outreach Recreation Program, or BORP, which remains active today. In fact, thousands of people with disabilities around the world are the beneficiaries of her refusal to be less than she knew she could be. Sygall is known for her unwavering passion for justice and her refusal to let social propriety get in the way of needed change, says Pat Wright, a Berkeley-based consultant who was formerly director of government affairs for the Disability Rights Education and Defense Fund. Wright has been a MIUSA exchange participant, and has witnessed Sygall in action. In New Zealand, Sygall challenged the Secretary of Transportation by staging a protest against inaccessible buses. In Palau, she yelled up to the Secretary of Education from the ground floor to leave his inaccessible, second-floor office and explain to her why disabled children were not attending the country’s schools. In both cases, she got the men to pay attention to access issues they were trying to ignore. As a teen, Sygall was able-bodied, athletic, and adventurous. She danced, hiked, and taught archery at summer camps. She was an 18-year-old freshman at the University of Colorado, in Boulder, on the August evening in 1971 when she agreed to a car ride that set her on a course she could never have envisioned. As they drove up a mountain road, Sygall noted, too late, that her date smelled like alcohol. Heading back down the twisty highway, he was driving way too fast. Was it the booze, or was he angry that she had insisted on going home early so she could get a good night’s sleep before the next day’s basketball tryouts? She never got a chance to find out. When the car slammed into a rock wall on the passenger side, the young man emerged unscathed, but Sygall was badly injured. The word paraplegic was new to her. She would come to know it well. cowritten with author Ken Spillman. The book addresses her accident and rehabilitation, but most of it chronicles her evolution into world traveler, disability rights advocate, nonprofit founder, and visionary. From mastering her unpredictable bladder and claiming her sexuality in a changed body, to confronting cultural stereotypes about people with disabilities, nothing quelled Sygall’s determination to live life fully, and to show other disabled people it is their right to do the same. Sygall’s post-accident path was forged in varying measure by passion, determination, and serendipity. While studying for her bachelor’s degree at Berkeley in the mid-’70s, a Rotarian International scholarship provided an opportunity for international travel. When her year in Australia was finished, she hitchhiked, in a wheelchair, through New Zealand for six weeks. In 1981, she was studying for her master’s degree in the UO’s therapeutic recreation program. While traveling in England during a break, she met one of the founders of Mobility International, a London-based agency (with chapters in many countries) that arranged cultural exchanges for people with disabilities. They wanted to establish a US chapter. Would she be interested? Today, MIUSA operates out of a warren of cubicles on the third floor of a downtown Eugene office building. The nonprofit has a staff of approximately 15—more than half are UO alumni—and an annual budget of $1.5 million. The no-frills office décor leans toward whiteboards, maps, calendars, and dozens of group photographs featuring participants from past international exchanges—Japan, Costa Rica, the former Soviet Union, Mexico, the Philippines, Bahrain, Azerbaijan. Organizations that supply funding to MIUSA are often puzzled as to why the nonprofit stays in Eugene when it might be a far bigger player in a larger city. But Sygall—who lives in Eugene with her partner, Tom, and their 155-pound Newfoundland, Yum Yum, and who most days rides an electrical-assist bicycle to work—has been adamant that MIUSA keep to its original roots. Eugene, after all, is a perfect size for visiting delegates, and MIUSA has amassed a cadre of welcoming host families. More importantly, the city models the inclusion and accessibility Sygall wants program participants to strive for in their own countries—“You can’t change what you can’t imagine” is one of her maxims. City of Eugene recreation staff take MIUSA delegates through the city’s outdoor Challenge Course and guide them on river rafting trips. By law, public buildings in Eugene are accessible. Lifts on all Lane Transit District buses allow program participants to move around the city independently. In the pool, Karine Grigoryan, from Armenia, cradles Nathalie Iboudo, from Burkina Faso, and gently tugs her in circles. Water makes Iboudo nervous, and she wears a flotation device around her torso. Grigoryan, who has cerebral palsy, assures Iboudo she can float on her own. “I said, ‘I can’t.’ But she said, ‘You can do it,’” says Iboudo, who has a disability caused by childhood polio. Grigoryan is a veteran of two WILD programs. She arrived at her first WILD conference quiet, shy, and concerned about her speech being understood. Since then, fueled by WILD power, she has founded a group promoting leadership skills for youths with disabilities in Armenia and become a board member of her country’s National Disability Advocacy Coalition. These days, she says, she hangs out with mayors, governors, and ambassadors. She knows Wild Women are capable of more than they realize. “I say, ‘My condition is worse than your condition. If I can, you can,’” says Grigoryan. The night of swimming offers a break in the exhausting 12-day schedule of workshops and meetings. The program covers basic WILD principles such as leadership skills, creating policies and legislation, cross-disability inclusion, collaborating with nondisabled allies, and creating concrete action plans. At the end, each woman goes home with the 250-page WILD curriculum and $3,500 to use toward implementing aspects of the program in their home communities. Many of the WILD delegates have already made an impact: In 2014, Dulamsuren Jigjid, from Mongolia, founded the Culture Center for the Deaf. Ekaete Umoh, from Nigeria, founded the Family Centered Initiative for Challenged Persons, which promotes inclusion for women and girls in development programs. Luu Thi Anh Loan, of Vietnam, is the cofounder of the Disability Research and Capacity Development Center, which works to improve the quality of life of people with disabilities. Her advocacy has helped secure two accessible buses in Ho Chi Minh City. Inclusion is a given in all MIUSA workshops and events, no matter the complexity or challenges. Take the issue of translation. During the WILD workshops, bilingual speakers provide simultaneous translation for the two Spanish-speaking participants. For deaf delegates, the program uses an intricate system involving two certified deaf interpreters and two certified hearing interpreters. This year, WILD deaf participants came from Ghana, Mongolia, Rwanda, and Zambia. All of them use a different sign language. Their hands flashing and their faces intent, the interpreters use a combination of American Sign Language, Ghana sign, and an international sign system to translate the workshop content. The English words are transcribed into a computer and projected onto a screen in front of the room. After four years of support, USAID will no longer be funding the program. So this year, a “Fashionista-Activista” fashion show kicked off a campaign to raise money for the next WILD program, which Sygall says costs about $350,000. The fashion show nudged the delegates out of their comfort zones. Most of them are used to being overlooked. But for this event they had their hair coiffed and their faces made up—they were going to be seen. One-by-one, some wearing traditional dress, others going modern, the WILD women wheeled or walked down an improvised runway, strutting their fashionista selves in front of an attentive audience while the emcee narrated the successes each has achieved. Each participant also told the audience how participating in WILD has made a difference in their lives. “WILD changed me from a mouse to a woman of action,” said Rose-Ann Foster-Vaughan, of Barbados. Since its inception, MIUSA has focused on empowering people with disabilities and instilling in participants their right to be fully included in their communities. Sygall and MIUSA have also led the effort to change attitudes and policies in international development organizations to make their programs and projects inclusive of people with disabilities. Most recently, MIUSA’s focus has shifted from inclusion to a strategy Sygall calls “infiltration.” It came about, she says, because she got tired of waiting. “We know how to make the change that needs to happen. It isn’t difficult. Why is it taking so long?” she says. This year’s WILD women are prepping to carry the torch. For the “Fashinonista Activista,” each delegate prepared a one-sentence statement expressing her hopes and dreams. Anisa Proda, a young PhD candidate in Albania who has cofounded an organization that empowers women and girls with disabilities, is blind. But when it came her turn to speak, she looked straight into the future. Alice Tallmadge, MA ’87, is a freelance writer based in Eugene.